Sen. Chris Ngige, Minister of Labour and Employment said this in an text messages (SMS) forwarded to Labour correspondents on Thursday morning in Abuja. It would be recalled that NARD embarked on a nationwide indefinite strike to press home a six-point demands which included non-payment of salary arrears, sacking of some of their colleagues, non-payment of “skipping’’ entitlement and the non-inclusion in IPPIS platform. Ngige said that the SMS was signed by Mr John Onyebueze, President of NARD. 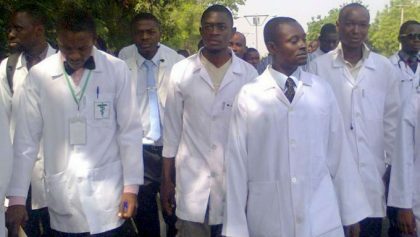 He said that the striking doctors in Nigeria have agreed to suspend their 10-day old industrial action. Meanwhile, Dr Onyebueze John, Presidnet of NARD, confirmed that the strike has been called off following a meeting of the executive council late Wednesday night. ”The National Executive Council of NARD met from 6:00 pm Tuesday, 12th September to 12:15am Thursday, 14th September 2017 to review the status of our nationwide strike and the offer from Government in the re-negotiated Memorandum of Terms of Settlement (MTS) with Government. ”After due consideration of the efforts by Government and progress made in addressing the items on the notice of our ultimatum, and strike, as well as implementing the contents of the re-negotiated MTS, NARD resolved to suspend her 10 days strike, and to reassess situation in two weeks at our AGM in Abuja,” the statement reads.